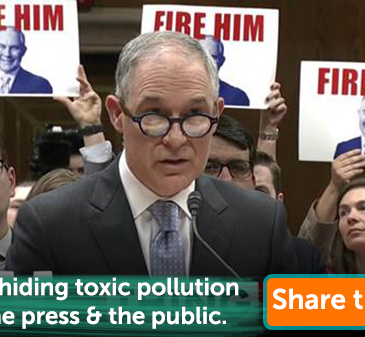 Last week, hundreds of 198 supporters joined more than 300,000 petition signers and 100 environmental and social justice organizations in calling on Congress to fire EPA Administrator Scott Pruitt. Don’t normalize this latest scandal with your silence. Share the news on social media using the links below, or forward this to friends on email. Chip in to support our ongoing work on this campaign. Last week more than 100 of us participated in petition deliveries from coast to coast. But Congress hasn’t responded to our demands. We need your support to keep planning escalating actions and protests that compel them to #FirePruitt. We’ve been petitioning Congress and the Administration for months to Fire Scott Pruitt, Trump’s racist, corrupt EPA administrator. In cased you missed it, Senator Bernie Sanders helped us lay out the case in a conference call (which hundreds of you participated in) early last week. Click here to listen to a recording if you missed the call (Drew helped moderate and screen your questions). Last week Pruitt was back on capitol hill to testify before a Senate subcommittee and so were our friends — A crew of activists silently held “Fire Him” signs behind Pruitt as he gave his opening remarks, and again owned the media narrative with stories on CSPAN, Politico, MSNBC, and more. But the action wasn’t contained to the committee room, or even the East Coast: More than 100 198 methods supporters signed up to deliver more than 300,000 petition signatures demanding Congress Fire Pruitt. There were rallies in New York, sit-down meetings in Philadelphia and Boston, and drop-bys and deliveries in Chicago, California, and hundreds of other locations. Back on capitol hill, Pruitt’s reception with the Senate was not a friendly one. As with last month’s hearing, Democrats generally called on Pruitt to resign and were harsher in their questioning. Republicans were generally more patient, though Republican Subcommittee chair Murkowski did refer to the scandals as “legitimate” concerns. A lot of questions at the hearing were about whether Pruitt may have had a personal hand in covering up a pollution report that the White House said would be a “PR nightmare” if released. The report in question is reported to expose the health effects from a class of chemicals used to make non-stick Teflon and some kinds of firefighting foam, which are called perfluorooctanesulfonic acid (PFOS) and perfluorooctanoic acid (PFOA). Other studies from government agencies have linked those chemicals to cancer, developmental disorders and a host of other health problems and hundreds of communities from Vermont to Souther California may already be contaminated contaminated. Which is why it’s suspicious that Pruitt’s EPA and the White House sought to block publication of a federal health study on a nationwide water-contamination crisis caused by PFOA and related chemicals. And, as if to confirm that he doesn’t want to talk about the human and environmental consequences, Pruitt chose not to invite victims, community leaders, and even major media outlets to today’s “National Leadership Summit” on PFOA, PFOS, and other chemicals. Chip in to support our ongoing work on this campaign.